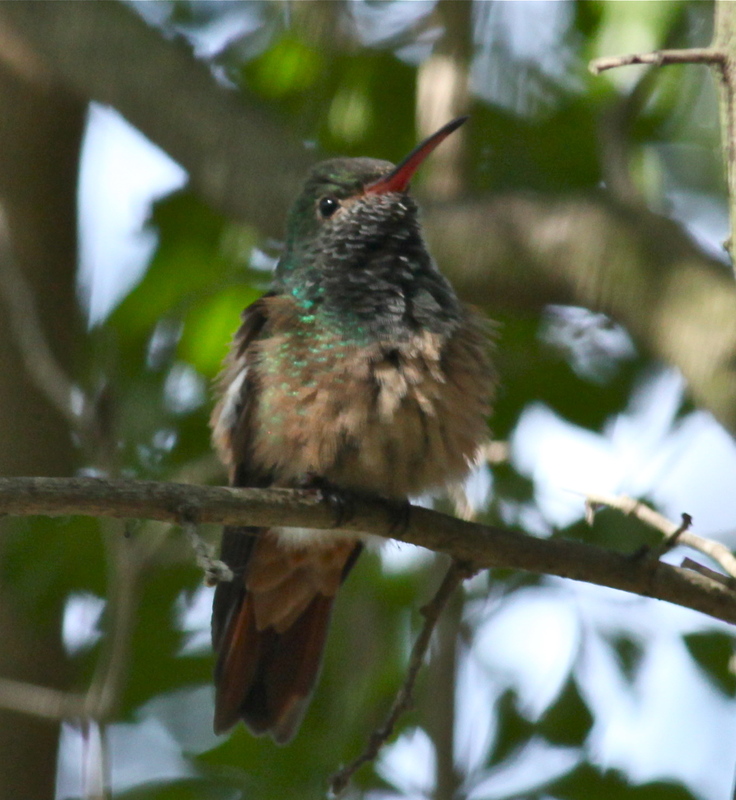 After my first day at the Rio Grande Valley Birding Festival I could hardly wait to get up the next morning and do more birding. The morning was cloudy and windy as a front was moving through the area. 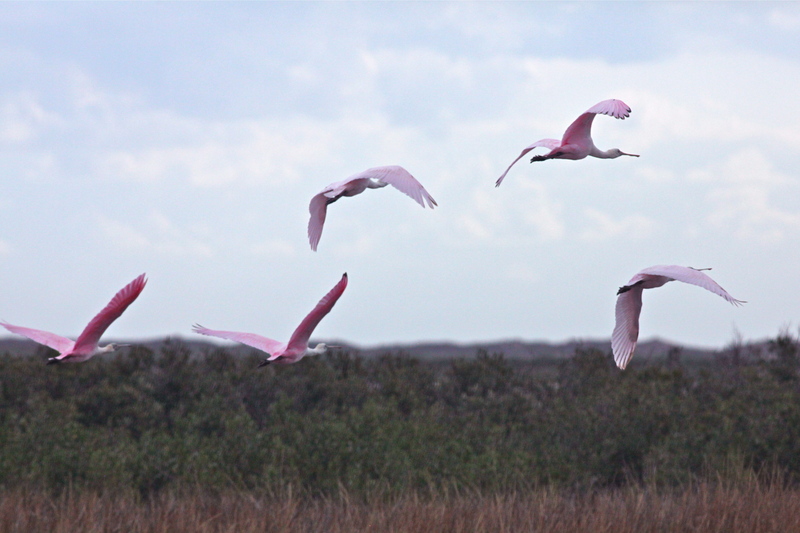 Nevertheless I was excited to set off for Laguna Atascosa National Wildlife Refuge. 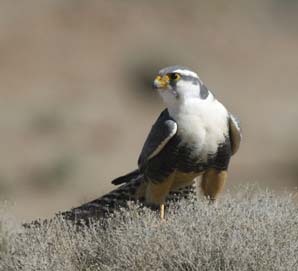 On the way to the refuge I saw two Aplomado Falcons, but both of them had flown by the time that I was able to stop my rental car. I certainly wish I had taken this photo. 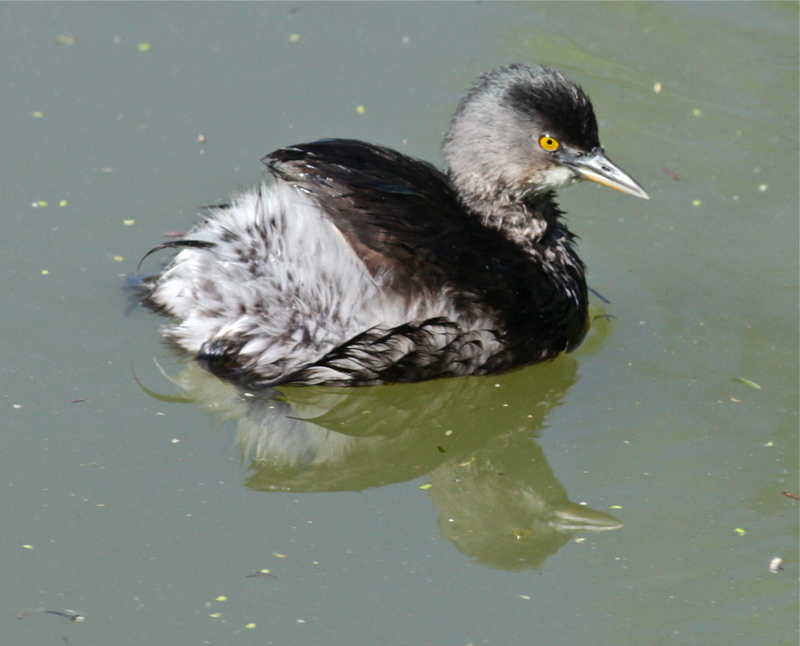 They are truly lovely birds! 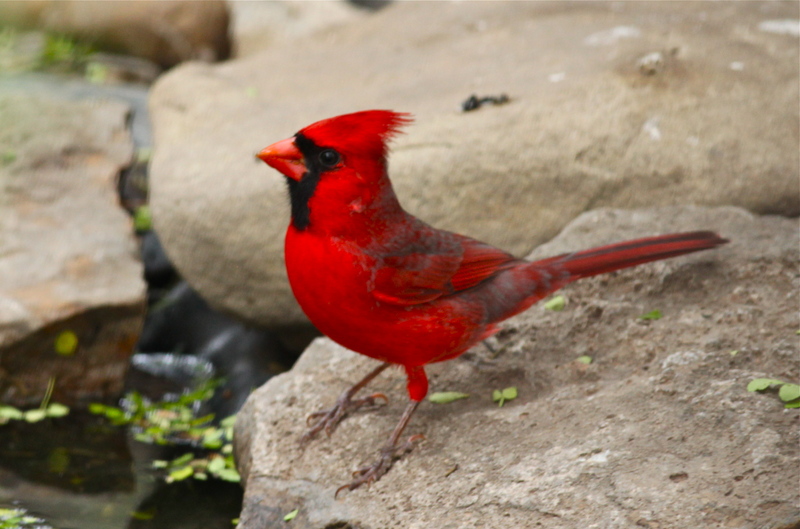 When I arrived at the Visitor’s Center I was delighted to see many residents at the feeding stations and the water feature. 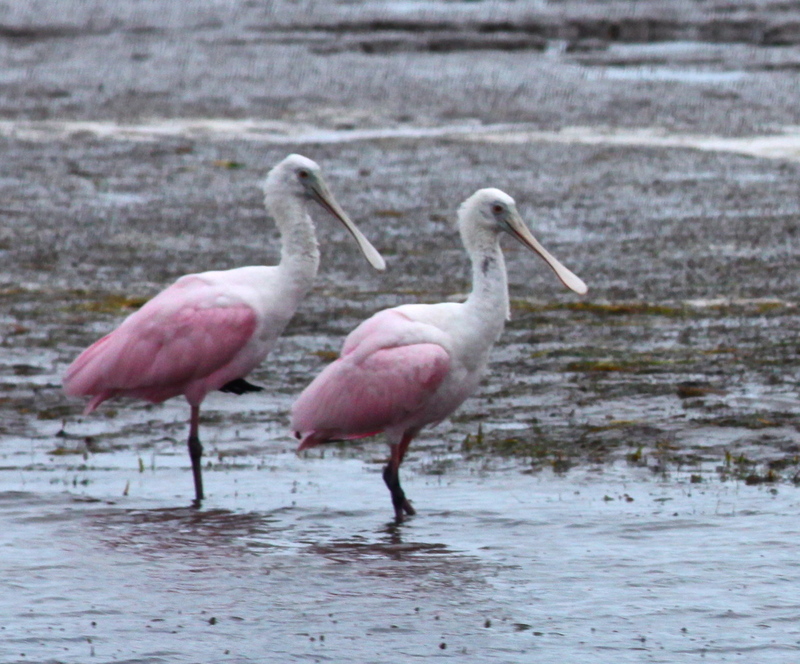 These are birds seen only in South Texas. 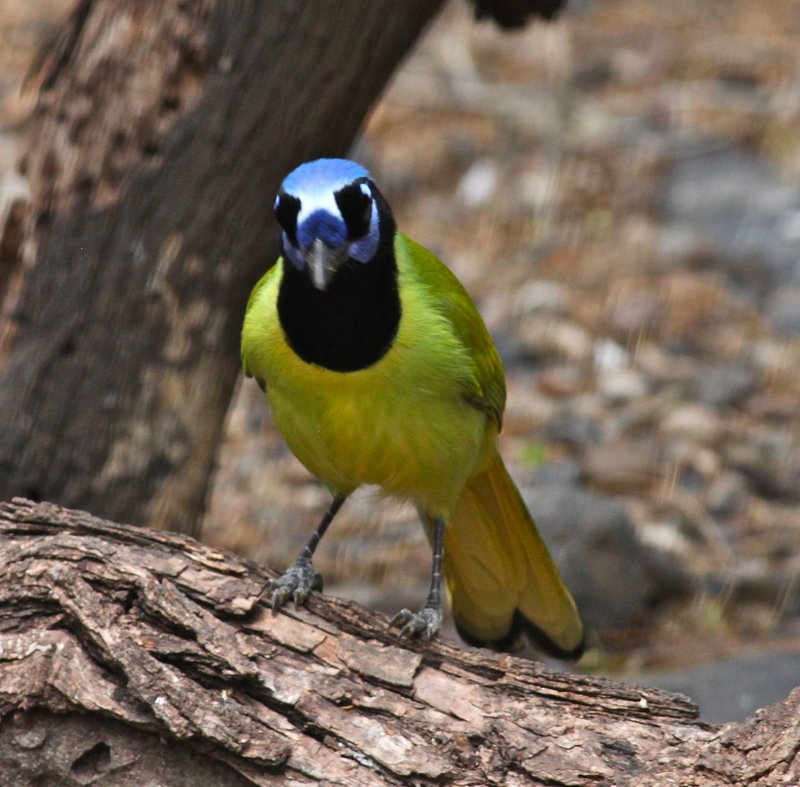 These are birds that you will not see unless you travel to South Texas. 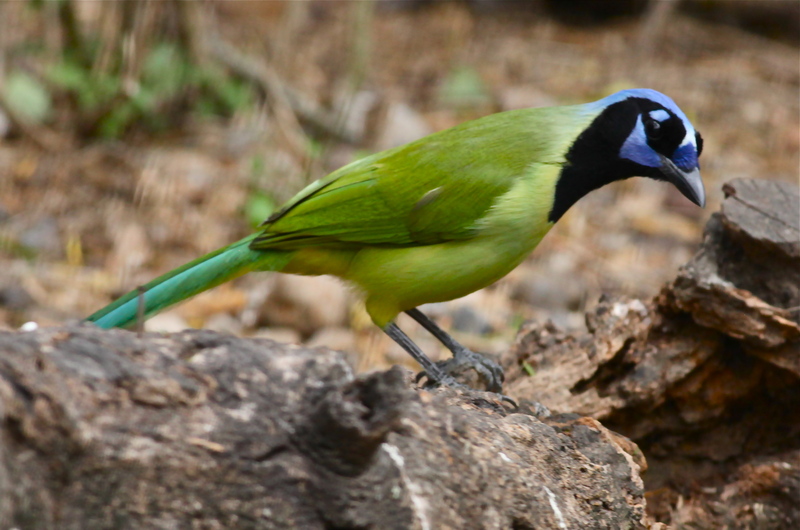 If you would like to see them without traveling to Texas, Sabal Palm Audubon Sanctuary has a very nice webcam so that people can see these beautiful birds. 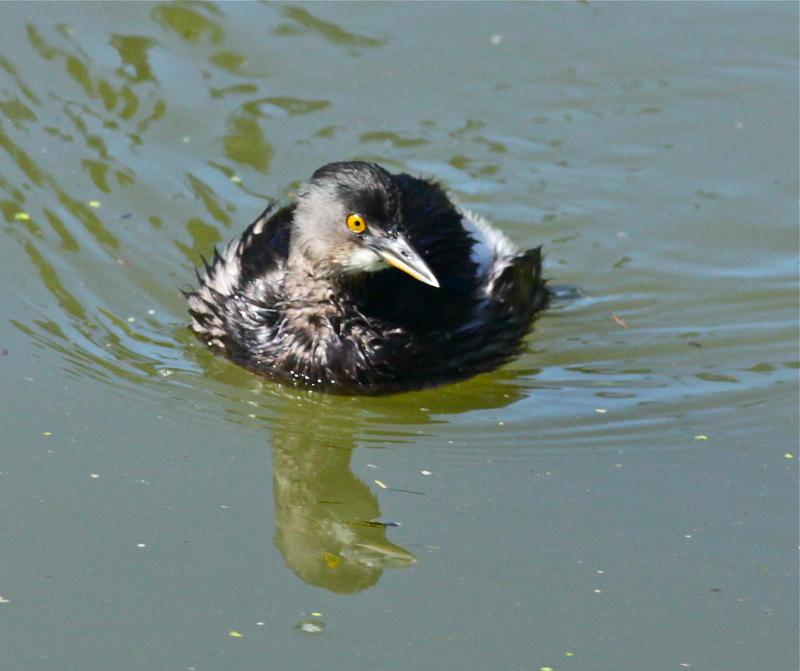 I am including this next bird because although it is a common bird for people in the Eastern half of the U.S., New Mexicans and most Westerners do not see this beautiful bird. The birds suddenly fled, and I looked for the cause of their disturbance. 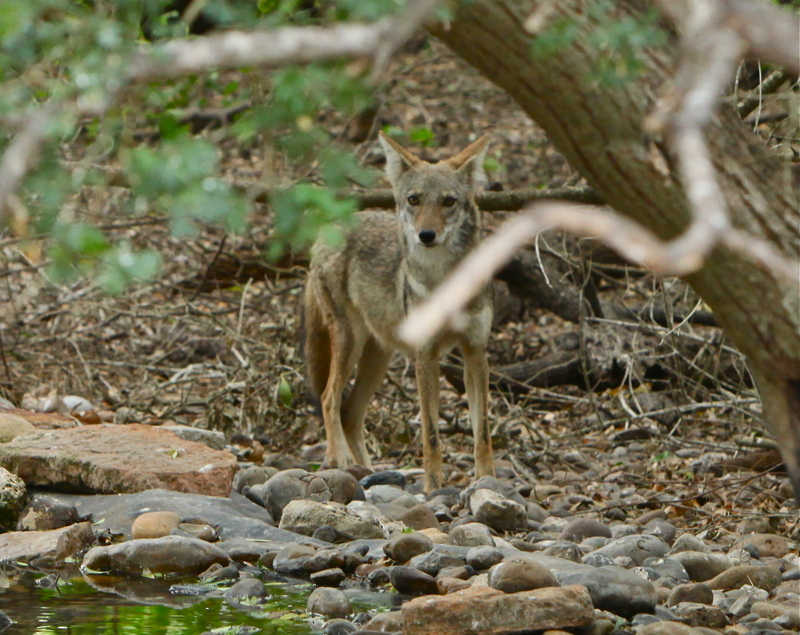 I finally spotted a small coyote in the underbrush, as wary of me as the birds had been of it. The coyote was quite small compared to the ones that I am accustomed to seeing in New Mexico. 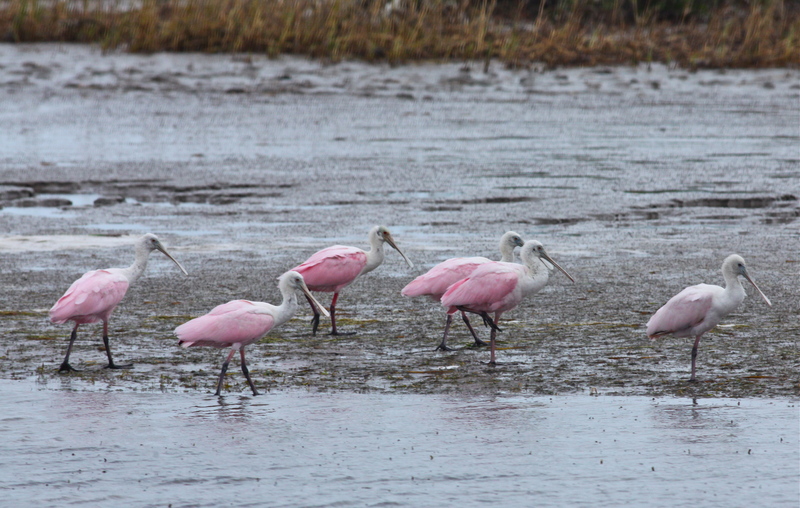 I drove the fifteen mile Bayside Drive loop, which runs for a significant distance along Laguna Madre, the bay between the mainland and South Padre Island. 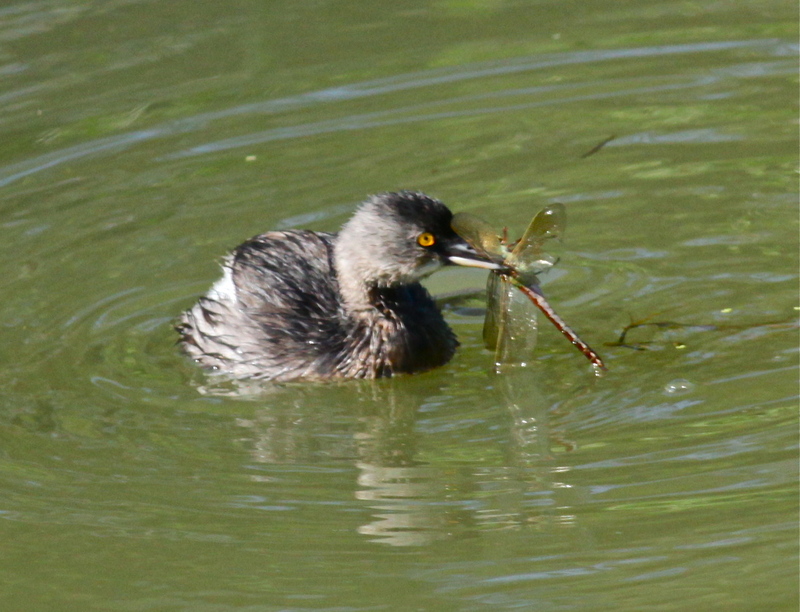 The scenery was interesting as desert scrub-type vegetation grows right to the water’s edge. 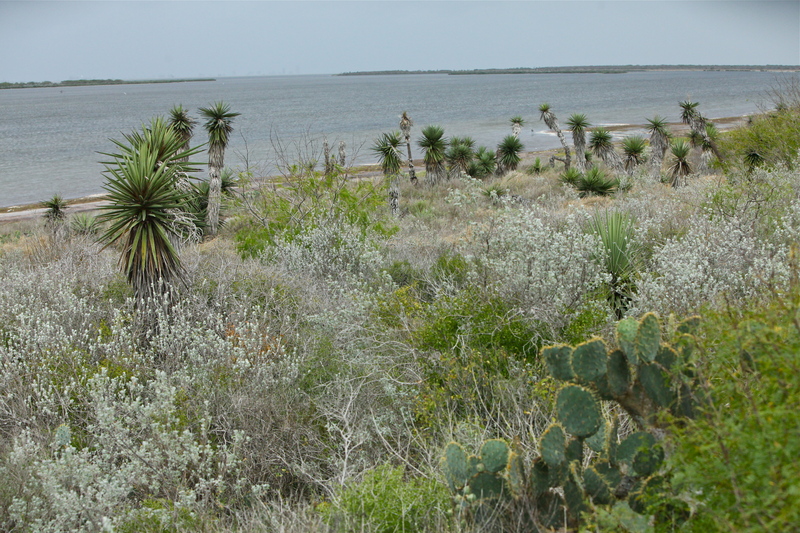 Laguna Madre Bay and desert scrub vegetation. 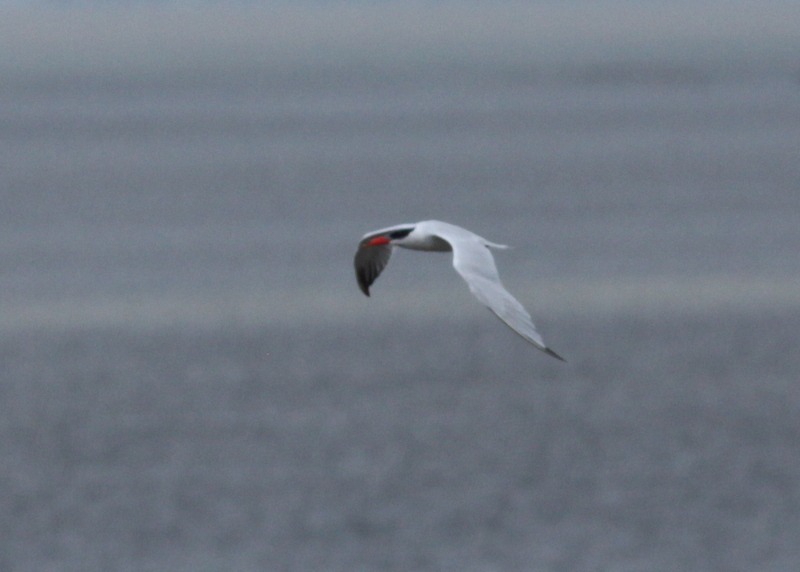 As I looked out over the bay, a Caspian Tern hunted overhead. Caspian Tern hunting above Laguna Madre Bay. 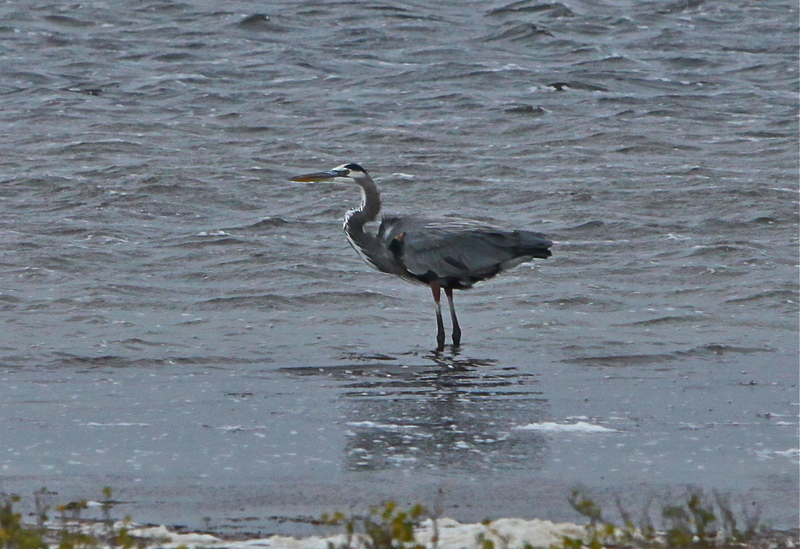 A Great Blue Heron fished in the shallow water near the shore. 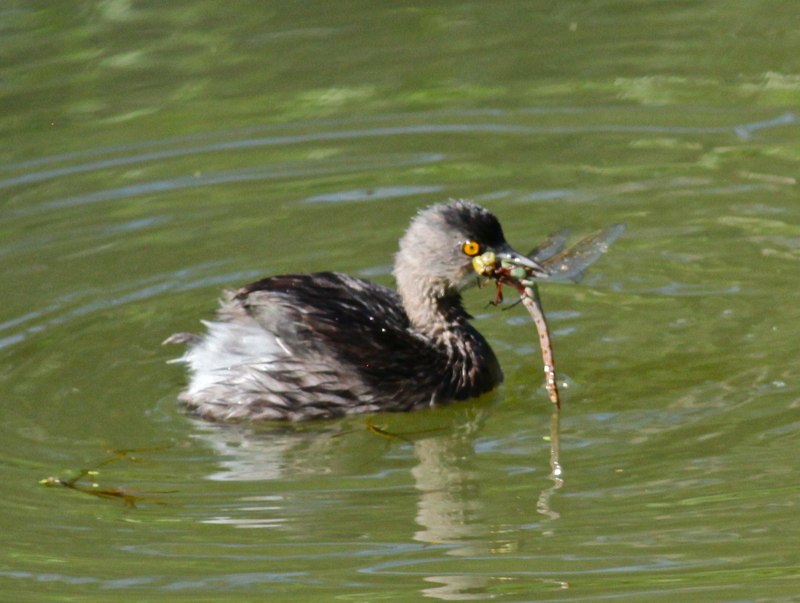 Great Blue Heron fishing in the shallows of Laguna Madre Bay. 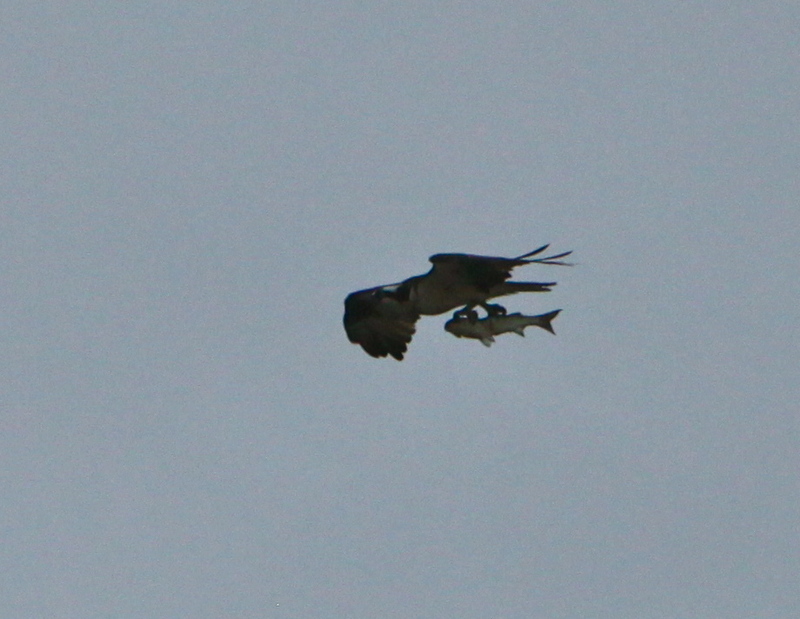 Osprey with fish, flying over Laguna Madre Bay. 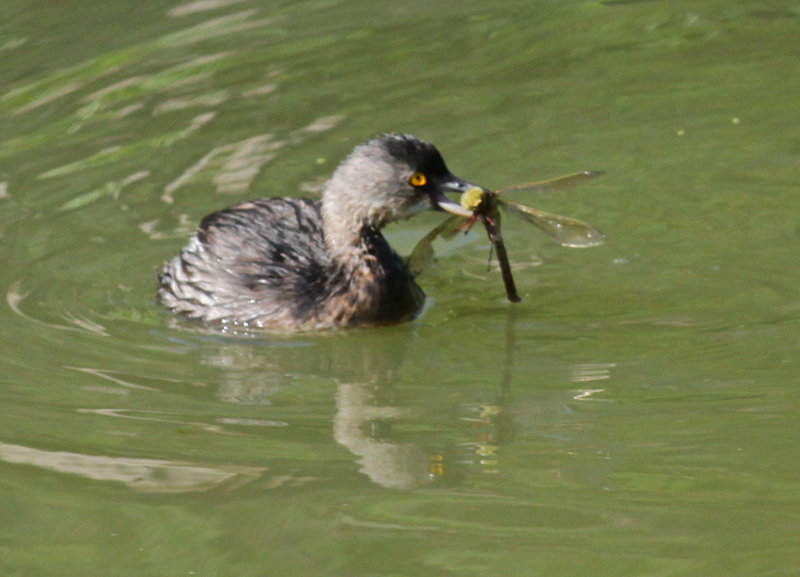 … but I was able to get a much better look when it landed on the shore. 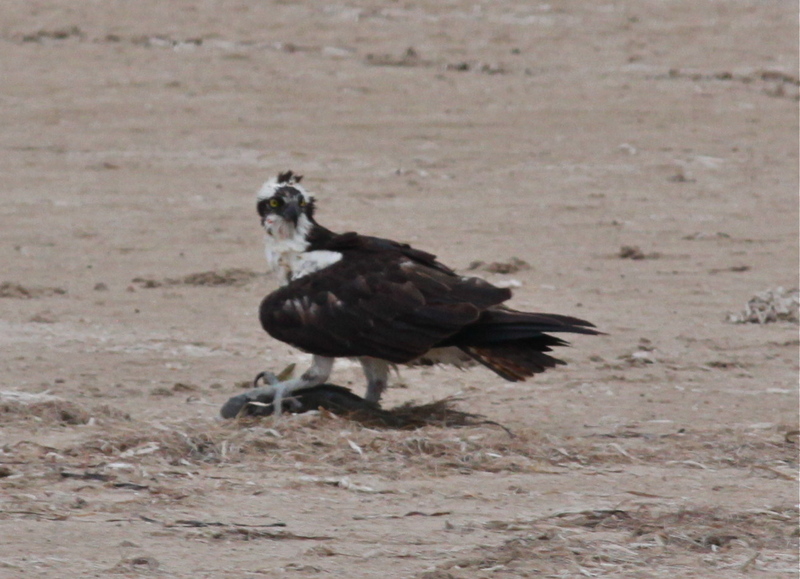 Osprey on the shore with fish. 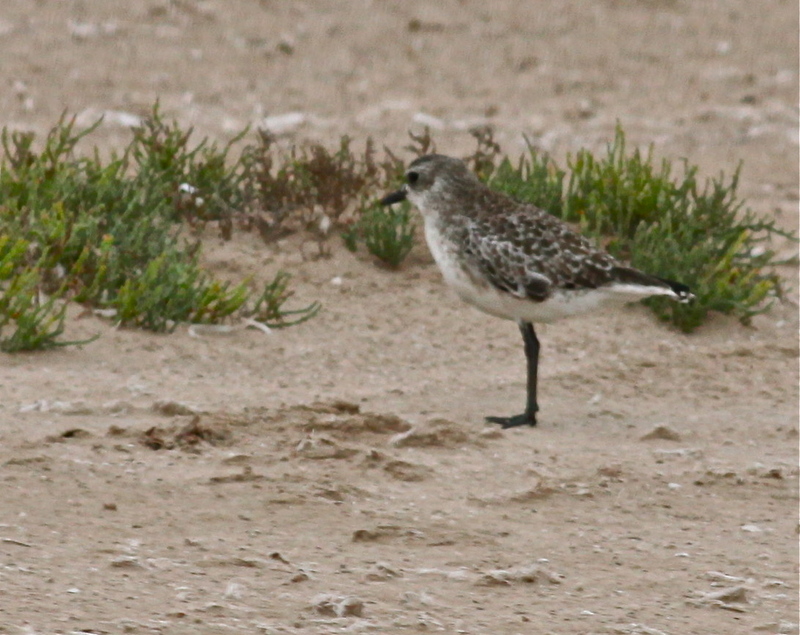 Several Semipalmated Sandpipers watched from a distance, hopeful of fish scraps. 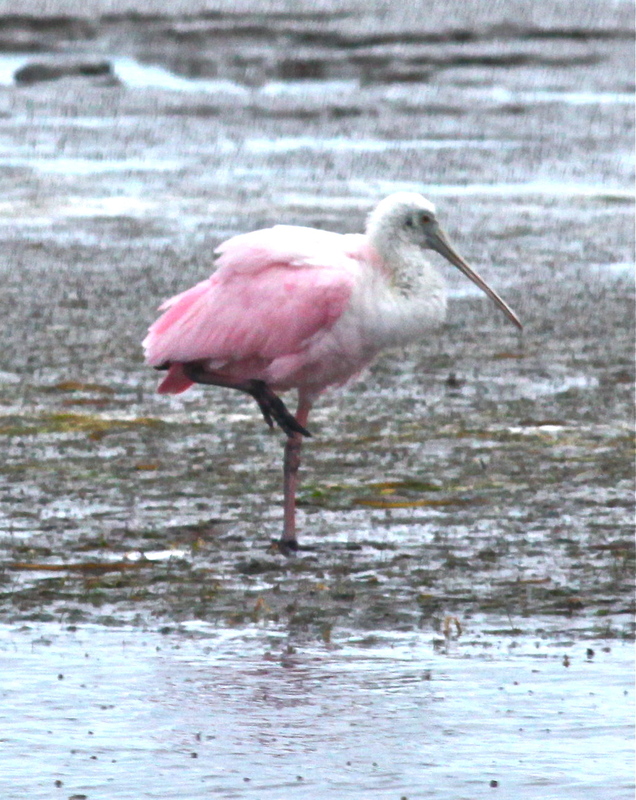 I continued along Bayside Drive and watched Egrets fishing in the shallow water of Laguna Madre Bay. 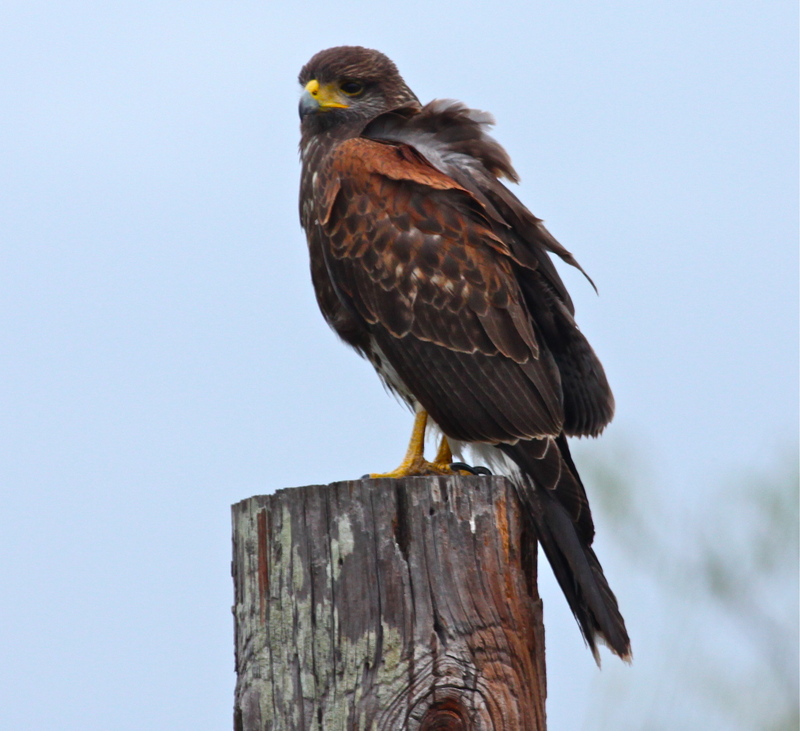 When I came to the end of Bayside Drive I saw a gorgeous Harris Hawk sitting on a post. 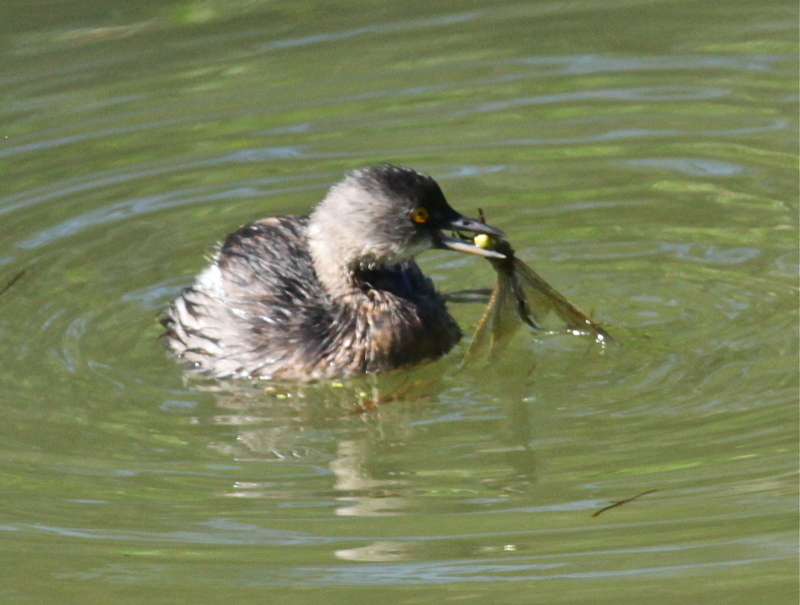 It was kind enough to post for several photos. 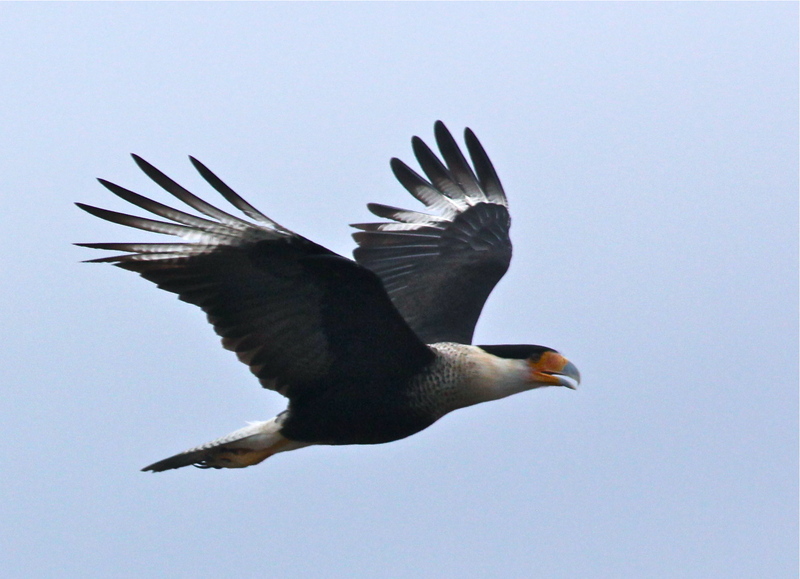 As I left Laguna Atascosa National Wildlife Refuge, I saw a Crested Caracara flying toward me. 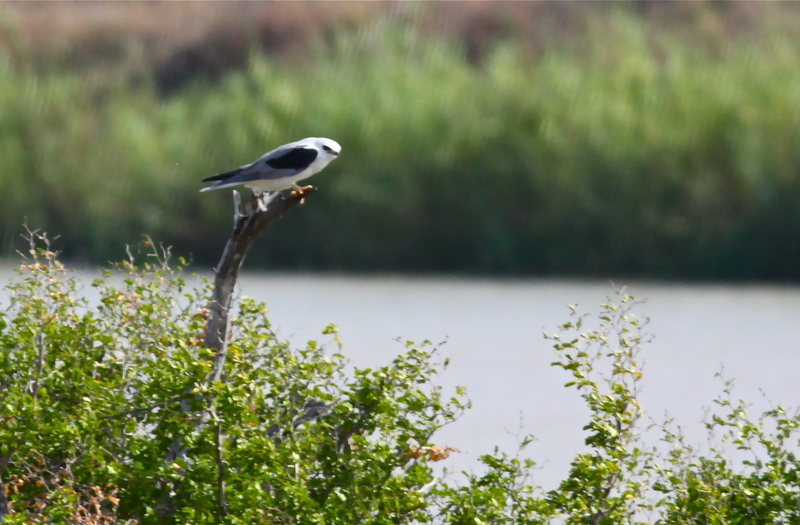 I was quicker than I had been with the Aplomado Falcon, and I was able to get a photograph. 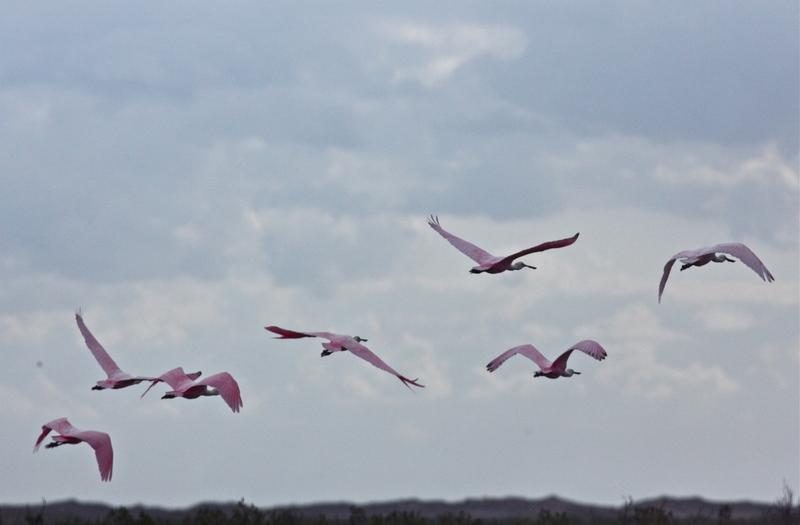 I thoroughly enjoyed my day at Laguna Atascosa. 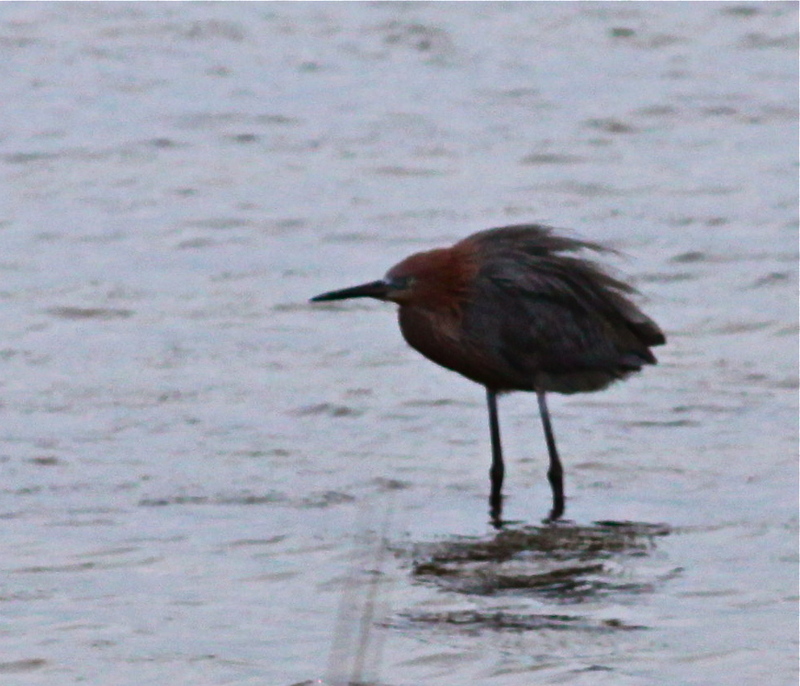 The next day would bring new challenges involving shorebird and sparrow identification, two of my weaknesses. 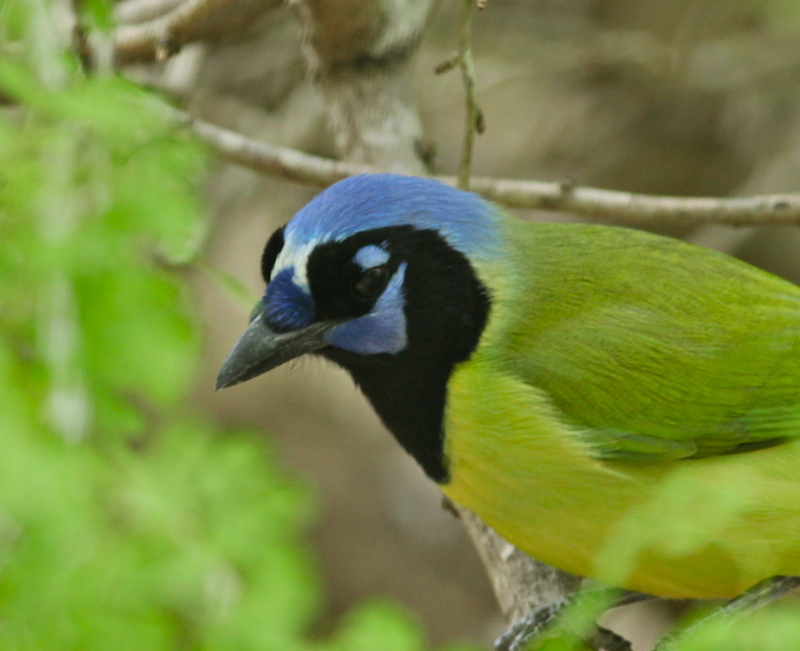 When I arrived in Harlingen, Texas for the Rio Grande Valley Birding Festival, I was overwhelmed with the many possibilities for birding in South Texas. 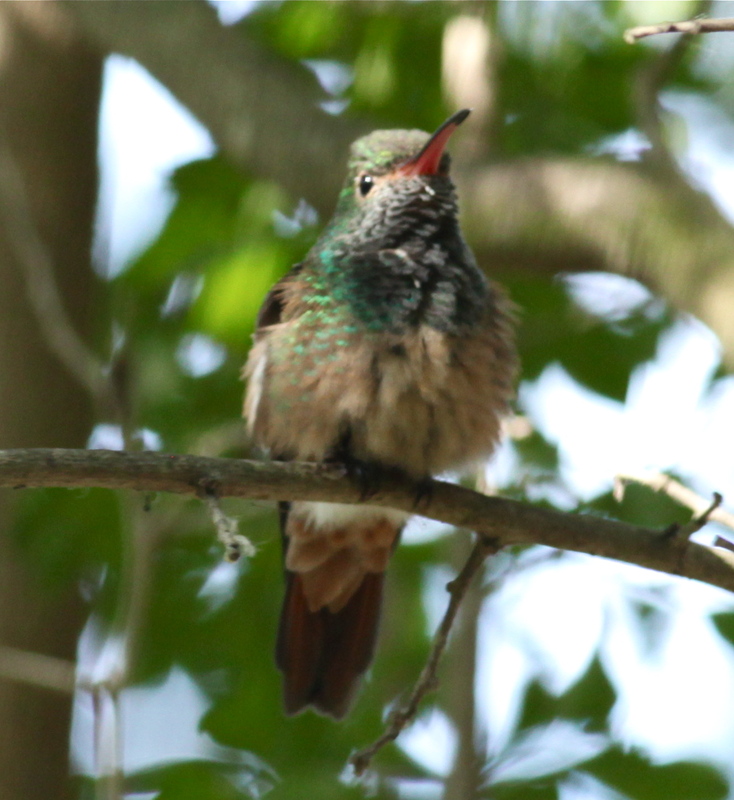 I was delighted when a Twitter and Facebook friend, Marsha Kraus Fulton, contacted me and offered to take me birding at Estero Llano Grande State Park the next morning. 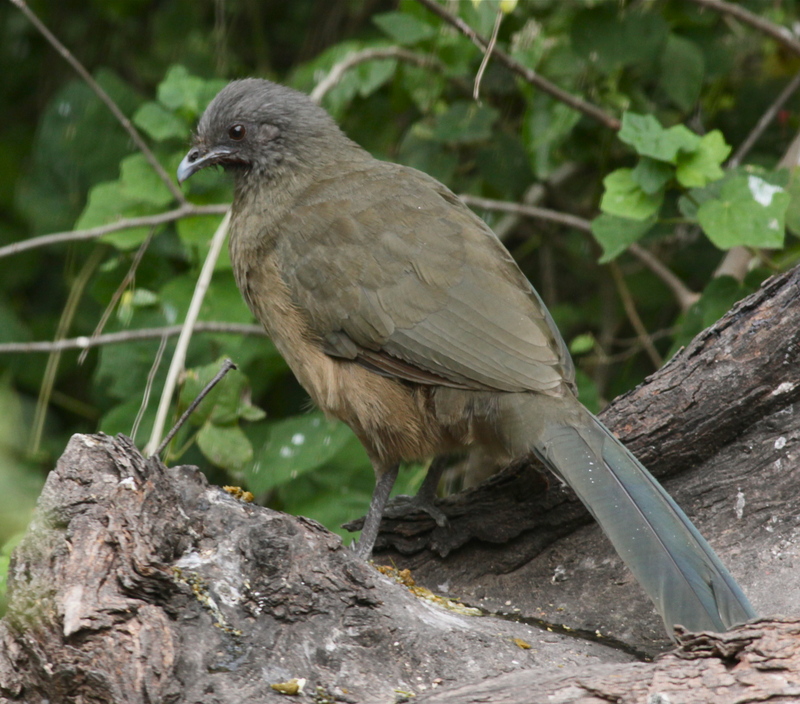 Estero Llano Grande is located in Weslaco, Texas and is part of the World Birding Center network, which consists of nine locations in the Rio Grande Valley. I was only a little late to meet Marsha in the parking lot. 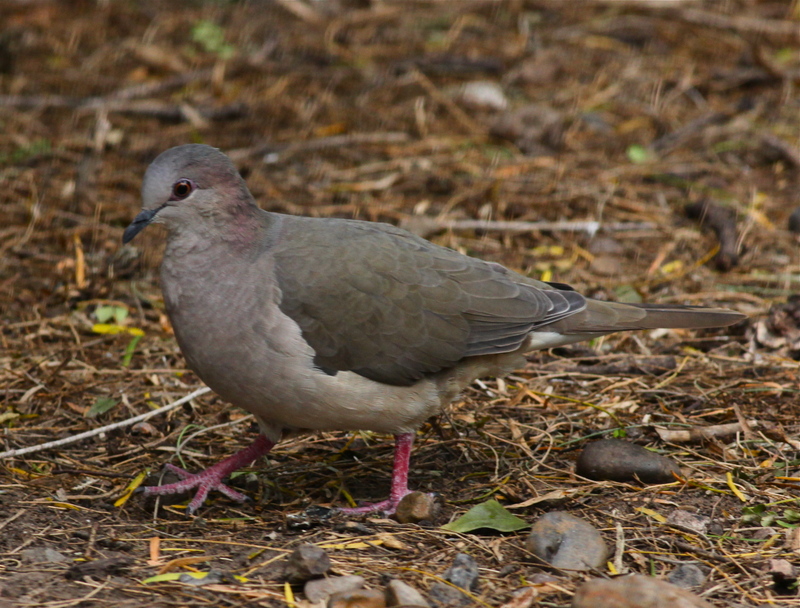 Fortunately, Marsha was familiar with the area, and she led the way through the birding center. 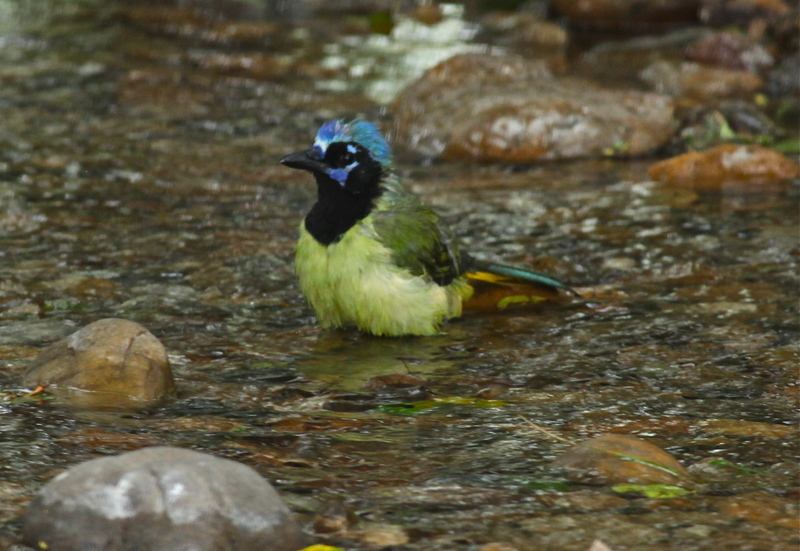 As we walked across a stream into a wooded area, a Great Kiskadee greeted us with a series of loud calls. 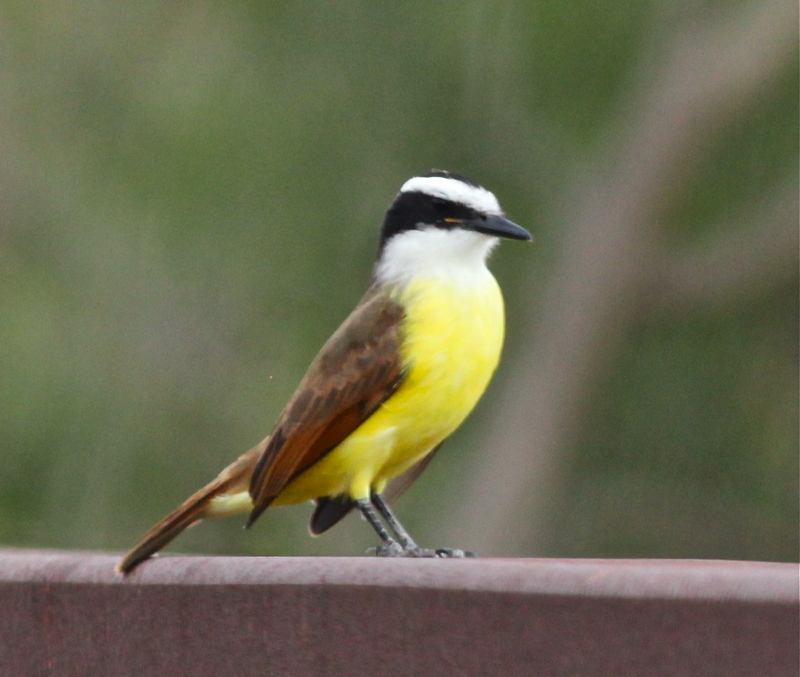 I heard the call of the Great Kiskadee very frequently throughout my visit to the Rio Grande Valley. You can hear it here. 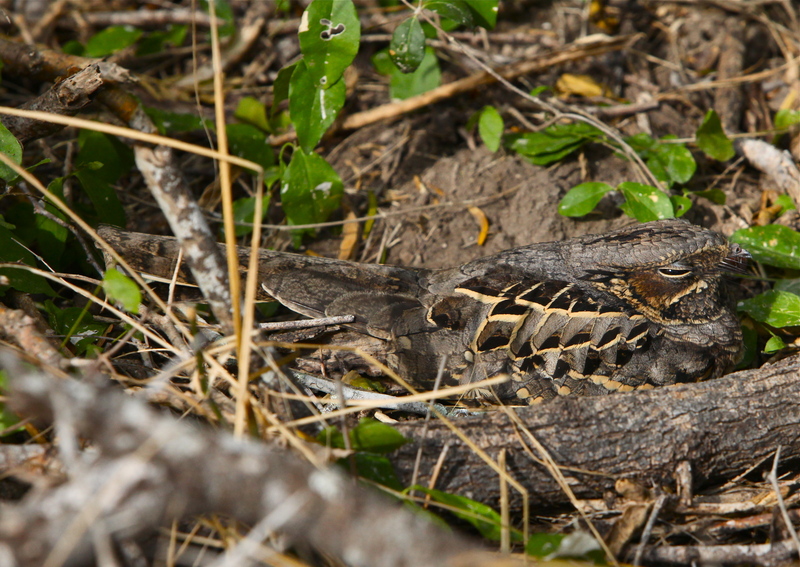 Next we walked to an area where Common Pauraques had been seen, and we were fortunate enough to see two of them. I would never have found them on my own, but Marsha knew where they had been seen. They blend so well with their surroundings that it is very difficult to see them, even when you know you are looking right at them. 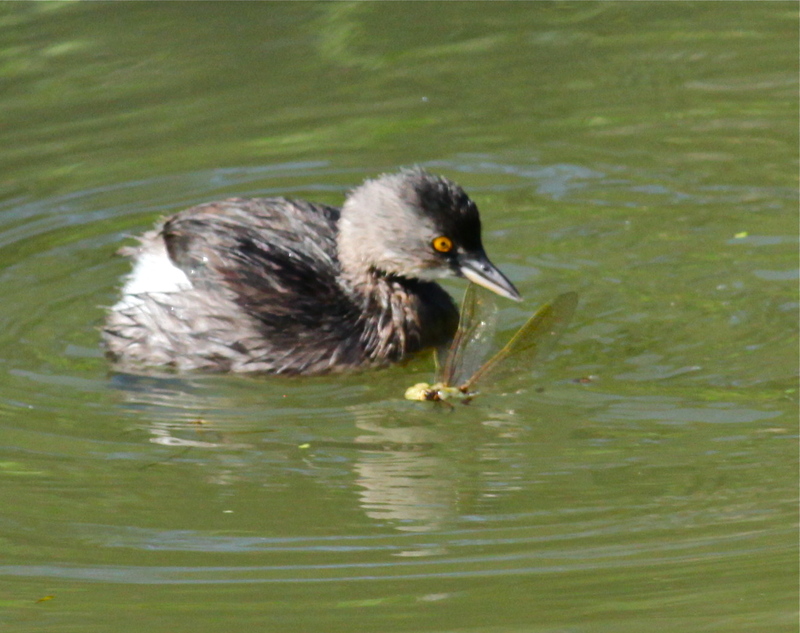 After quietly oohing and aahing over the beautiful plumage of the Common Pauraque we walked over to the alligator pond. 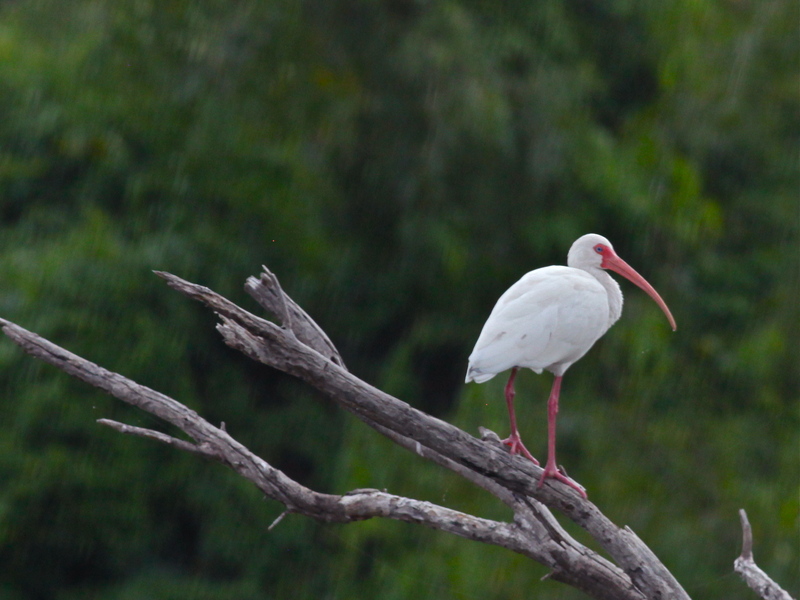 Although we did not see any alligators, we did see a White Ibis standing sentry over the pond. 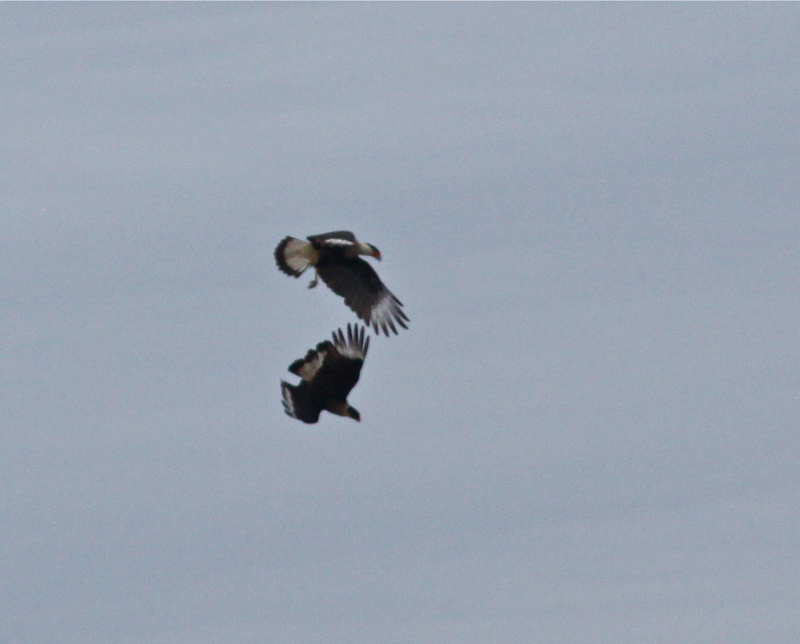 We continued up onto the levee and stopped to watch American White Pelicans circling overhead. 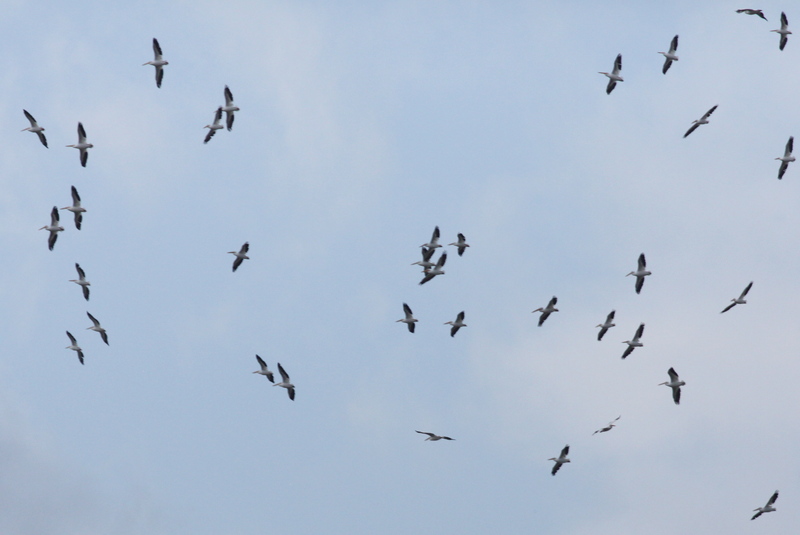 Their flight patterns reminded me of the Sandhill Cranes that we see in New Mexico. 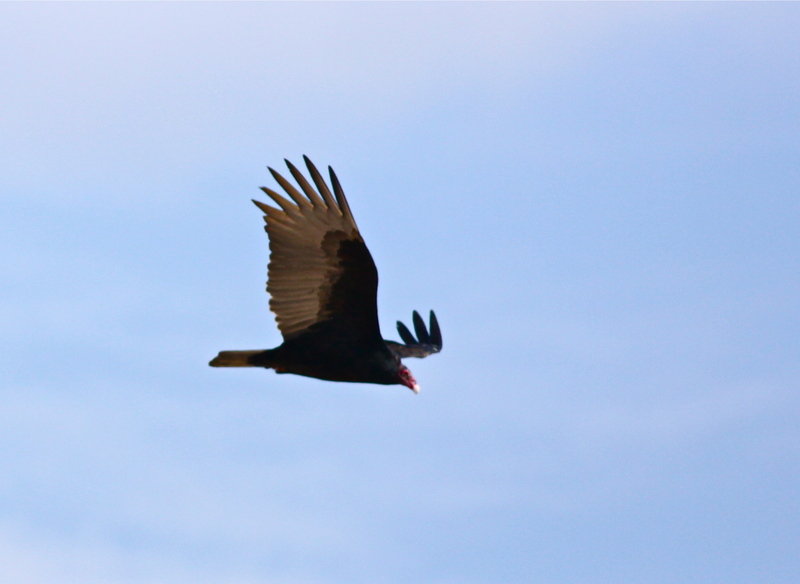 … and a Turkey Vulture flew overhead. We continued into another wooded area where feeders had been set up. 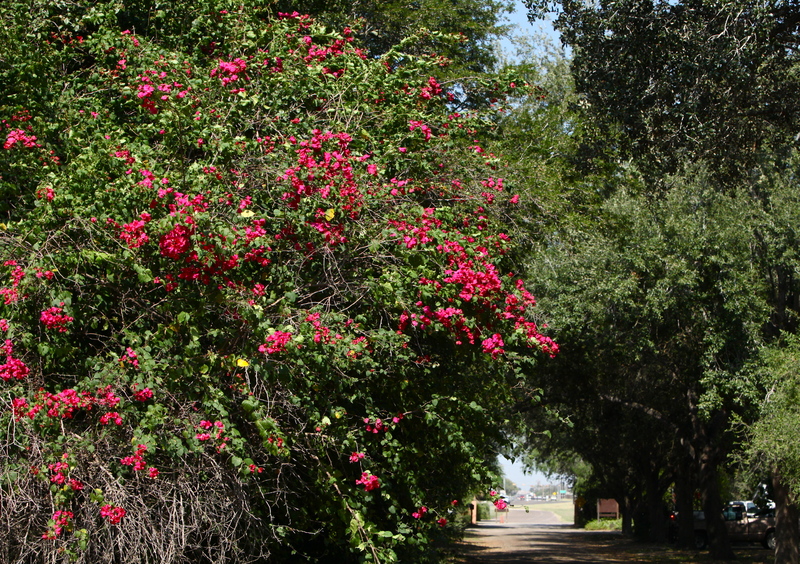 I loved the large Bougainvillea that were growing in this area. 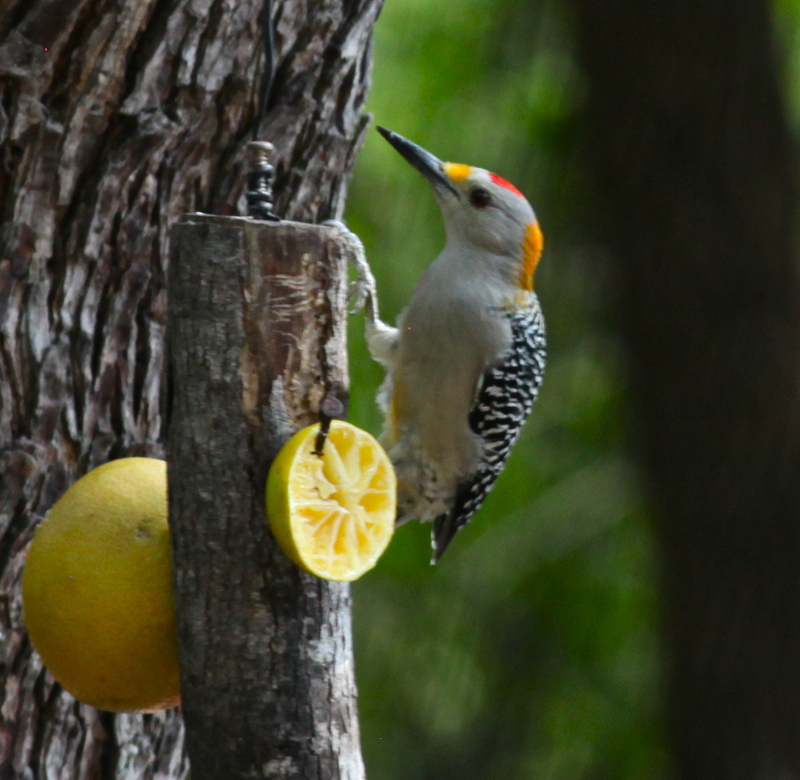 In the feeder area we saw a beautiful Golden-fronted Woodpecker feeding on citrus. 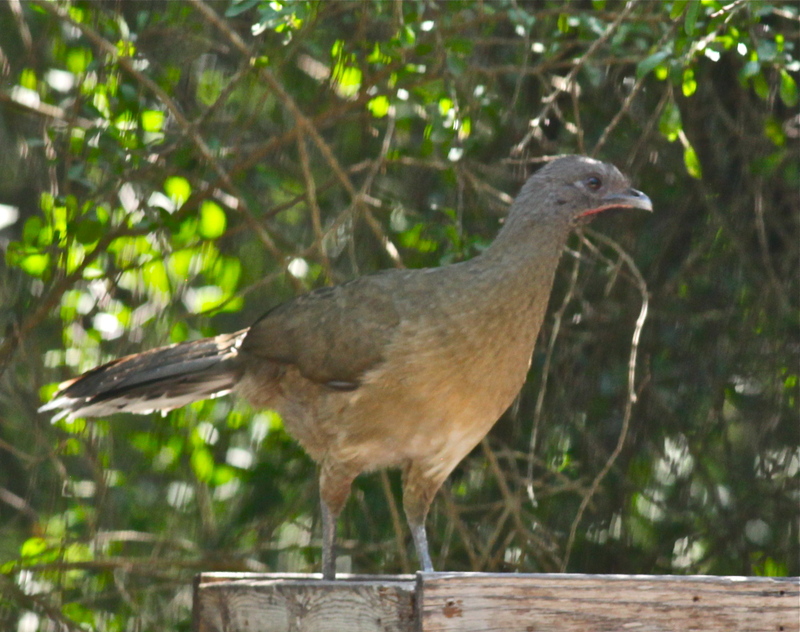 Plain Chachalaca announced themselves noisily. 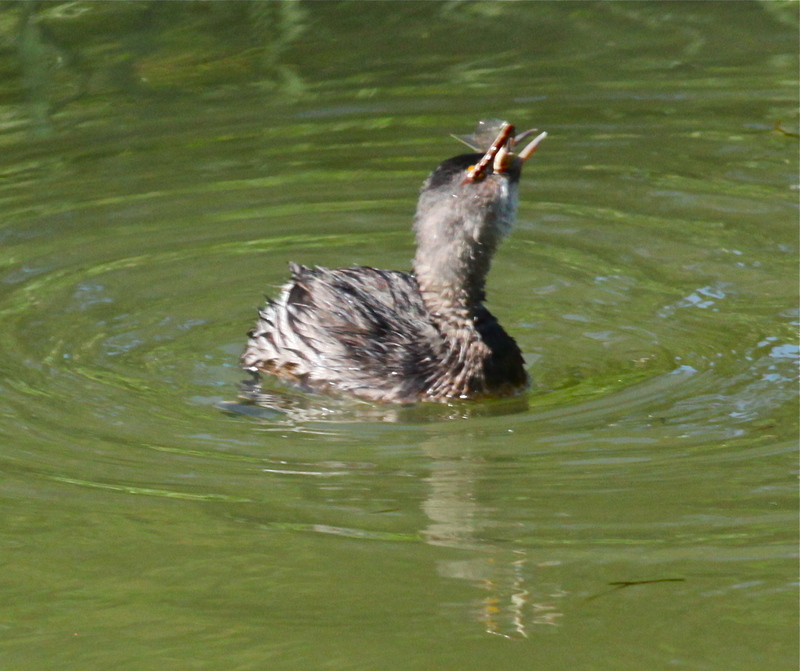 You can hear the raucous call of these noisy birds here. 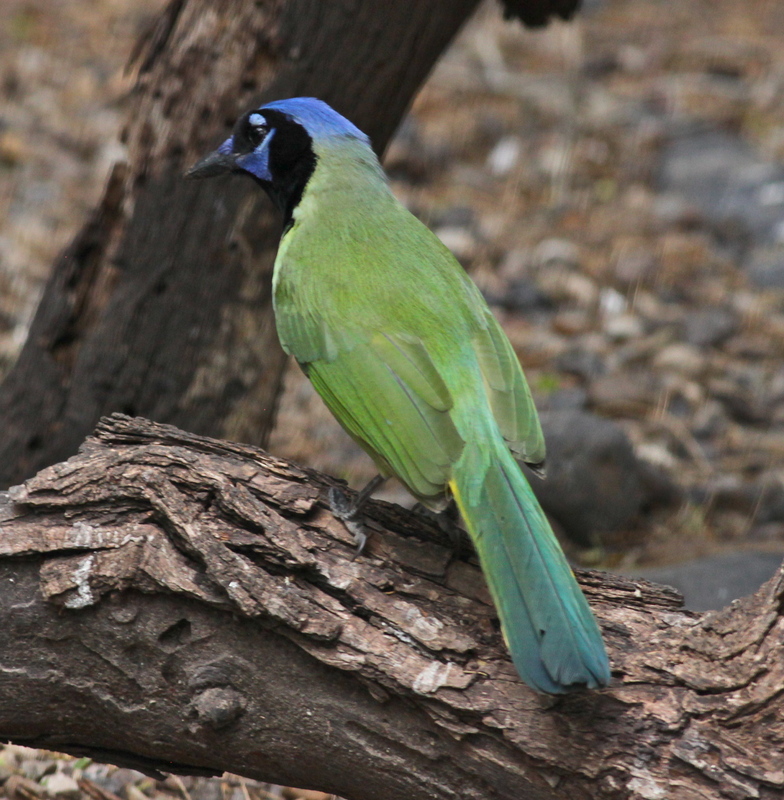 I saw a flash of color in the trees, and I saw my first Green Jay, one of the birds that I had really hoped to see during my visit. 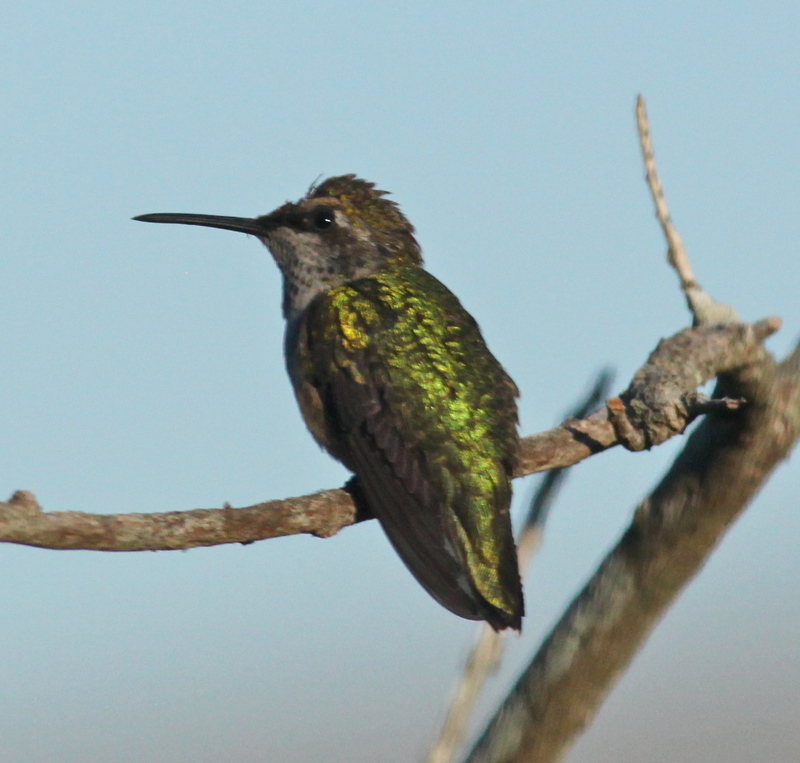 On the way to the hummingbird area, we paused to look at a few butterflies. 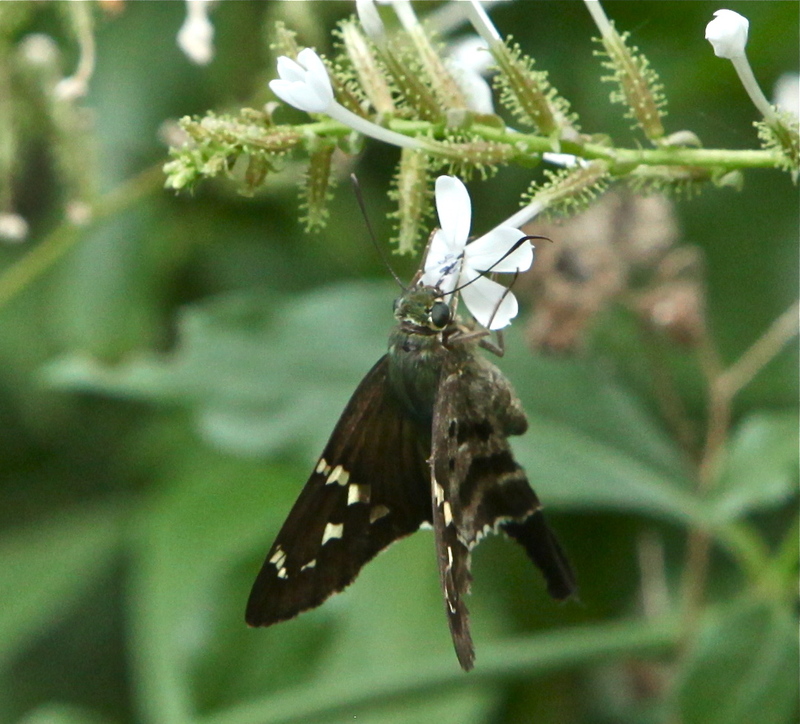 We saw this lovely Dorantes Longtail (Urbanus dorantes). Perhaps the highlight of our day was seeing the very rare Blomfild’s Beauty (Smyrna blomfildia), a lovely and rare butterfly, who was sitting on a feeder along with a very worn and tattered Mexican Bluewing female. 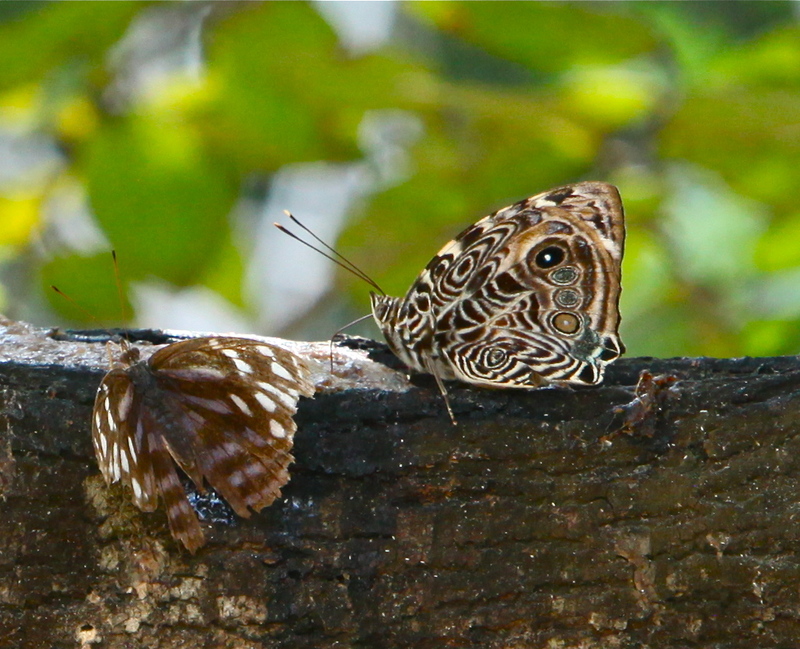 Blomfild's Beauty (Smyrna blomfildia) and tattered Mexican Bluewing female. 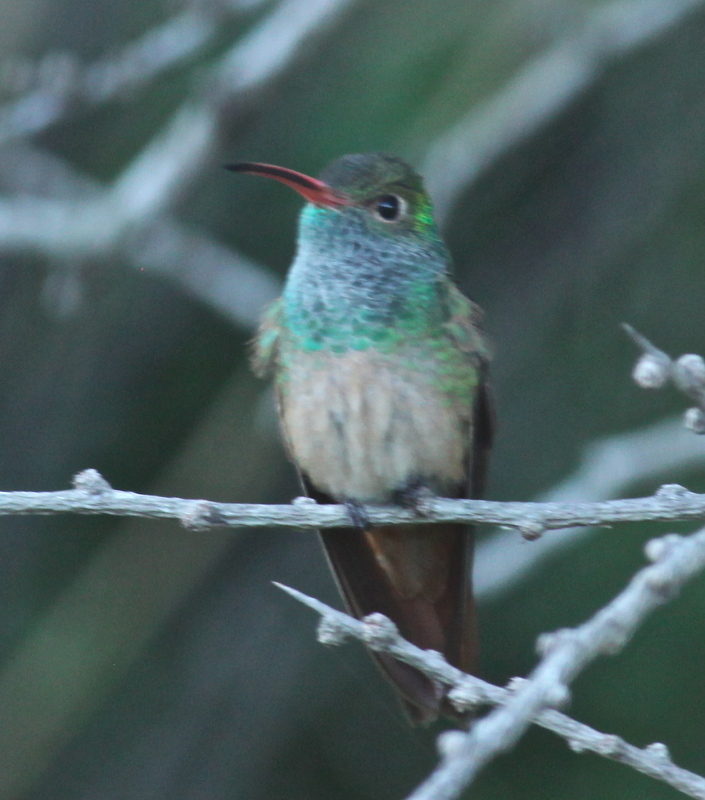 … and this lovely Buff-bellied Hummingbird. 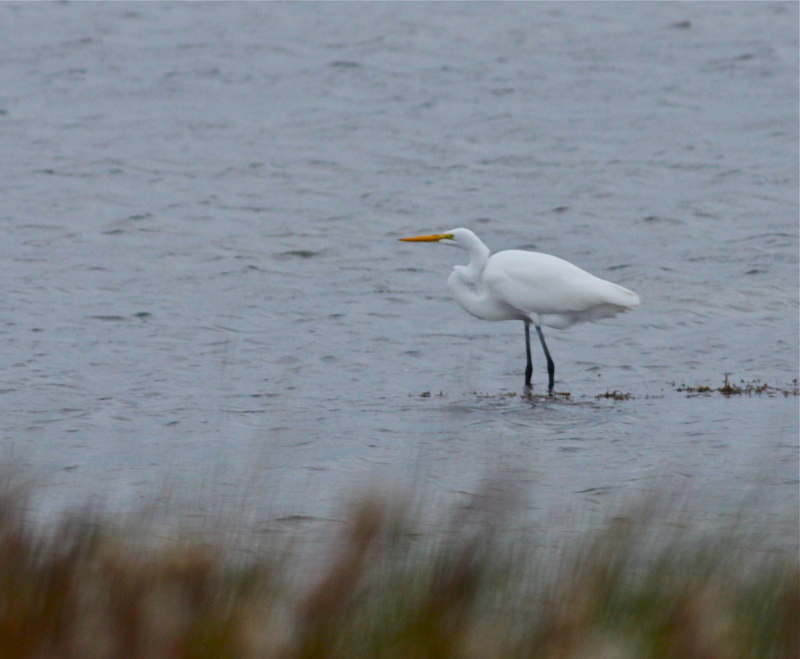 Marsha was a wonderful guide, and I am very grateful for her kindness in showing me a beautiful birding area. 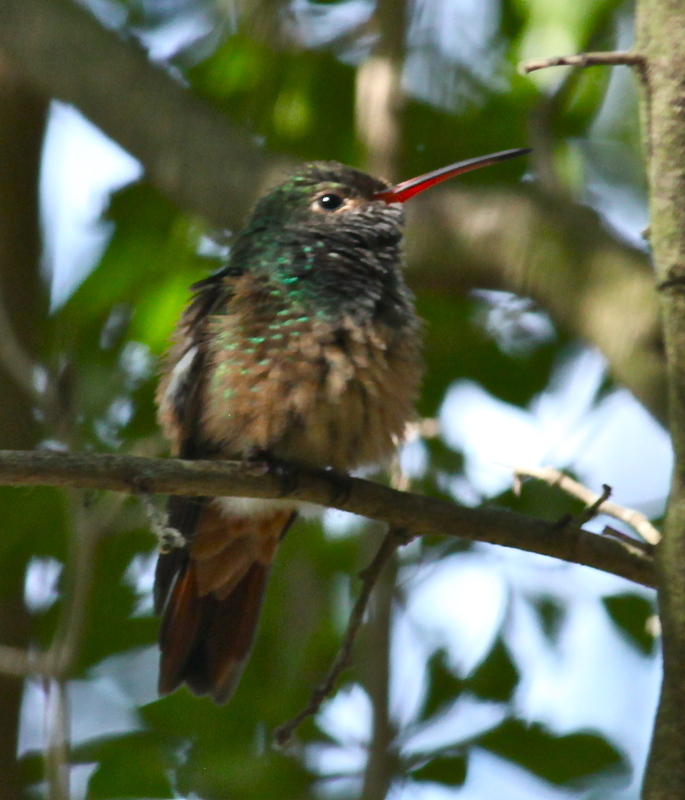 At the end of the day I began to dream of more lovely birds to see in the following days. 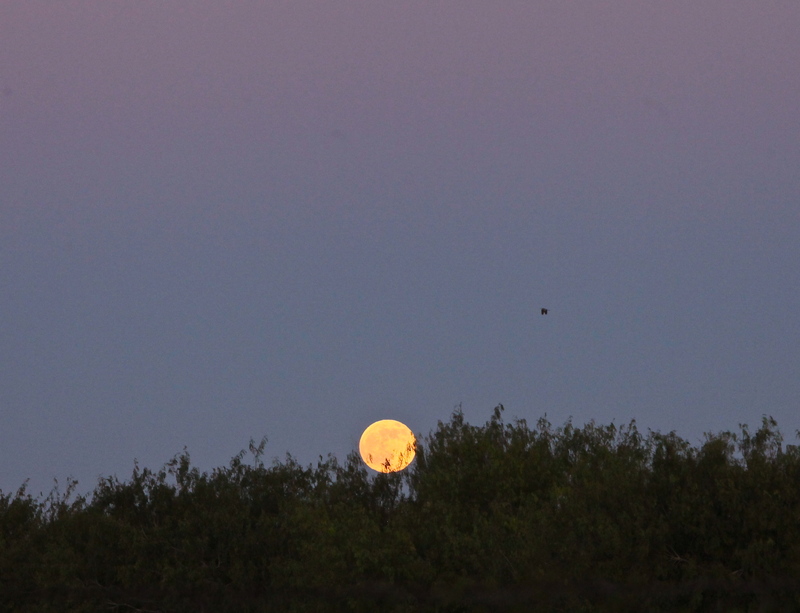 If you enlarge the photo, you will see that the black dot above and to the right of the rising moon is a Great Blue Heron flying overhead. 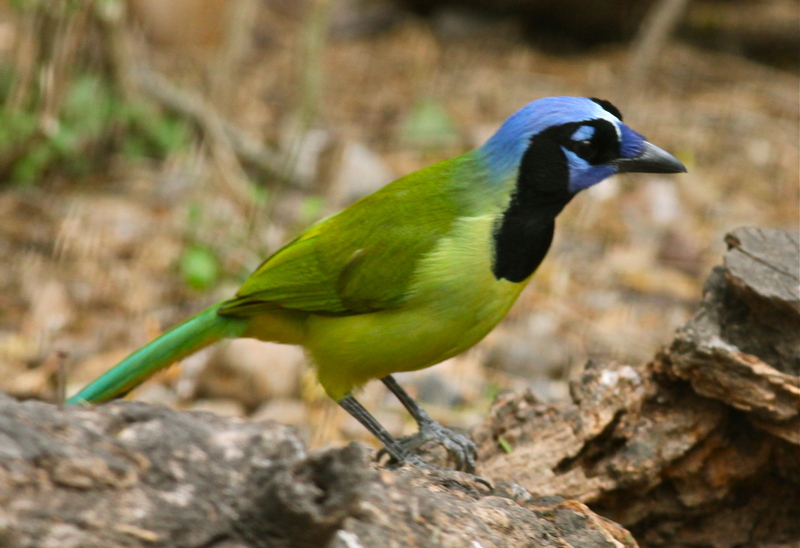 One of the birds I especially wanted to see at the Rio Grande Valley Birding Festival was the Green Jay. 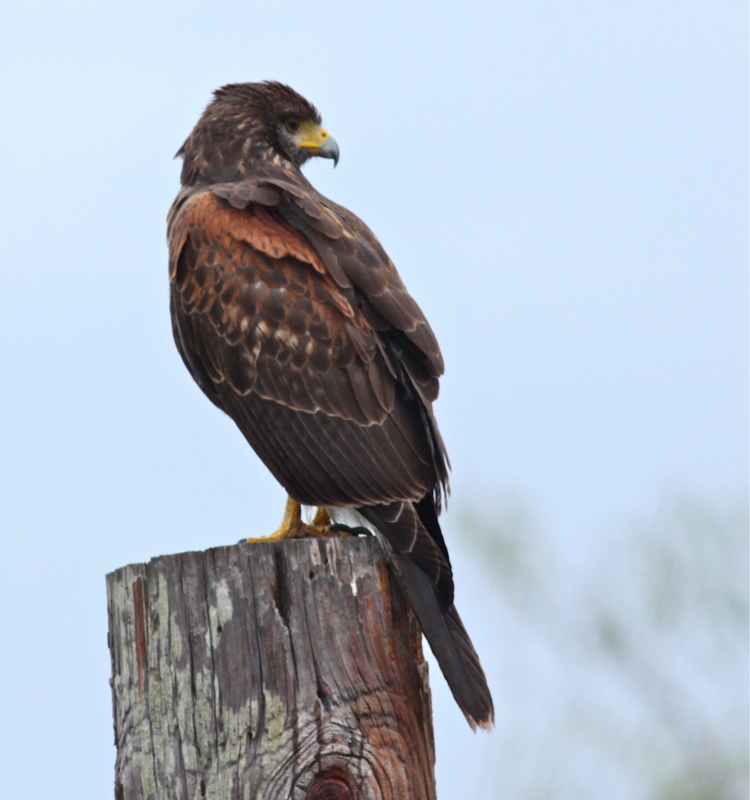 It is not unusual to see these beautiful birds in South Texas, but they are not found elsewhere in the US. 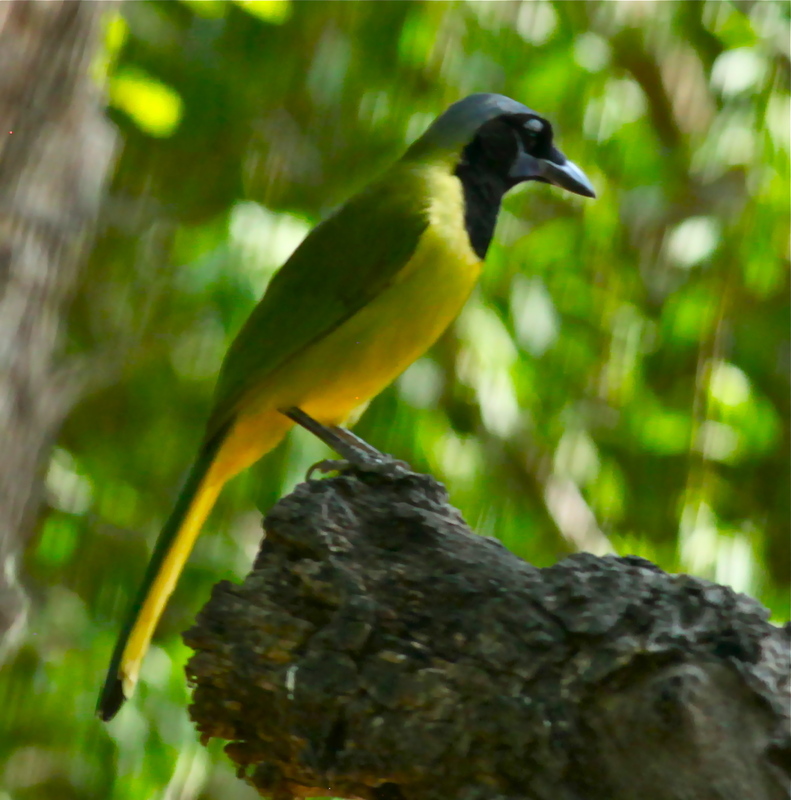 I drove to Laguna Atascosa National Wildlife Refuge to look at shorebirds, and I was surprised and delighted to see many Green Jays there. 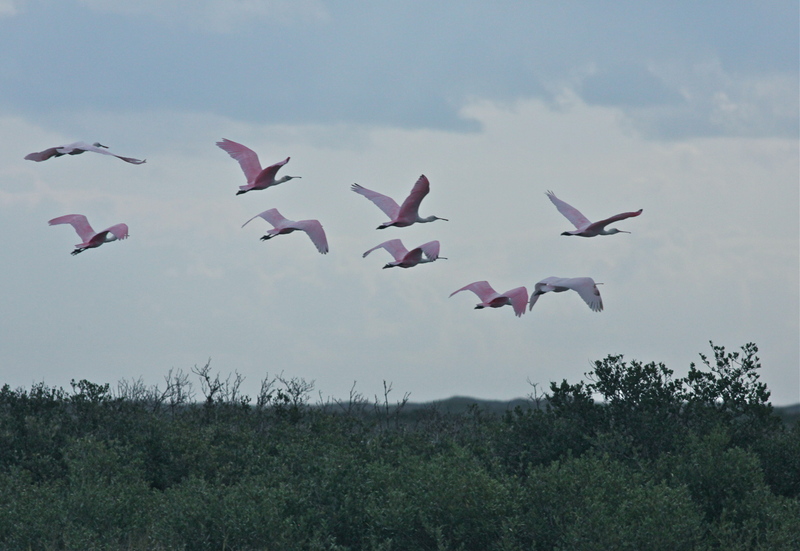 Laguna Atascosa NWR is a region of Texas which some call the last great habitat. Here, thorn forest intermingles with freshwater wetlands, coastal prairies, mudflats and beaches. 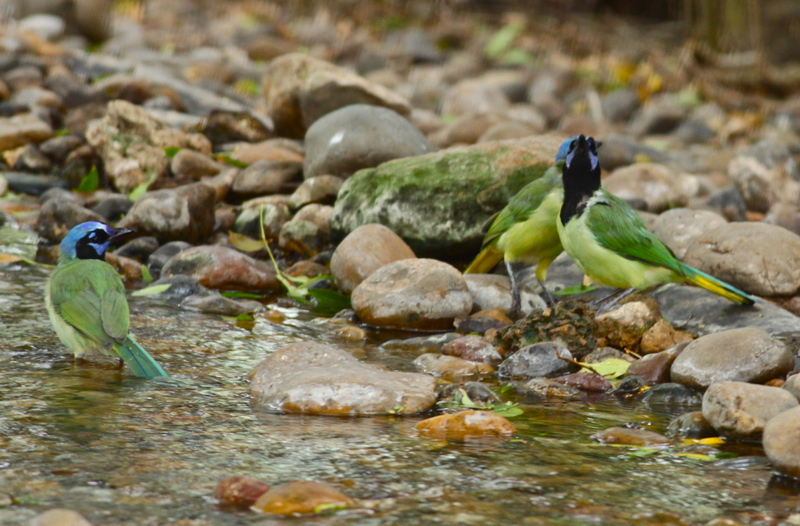 These Green Jays were drinking and bathing at a water feature. They are truly beautiful birds. 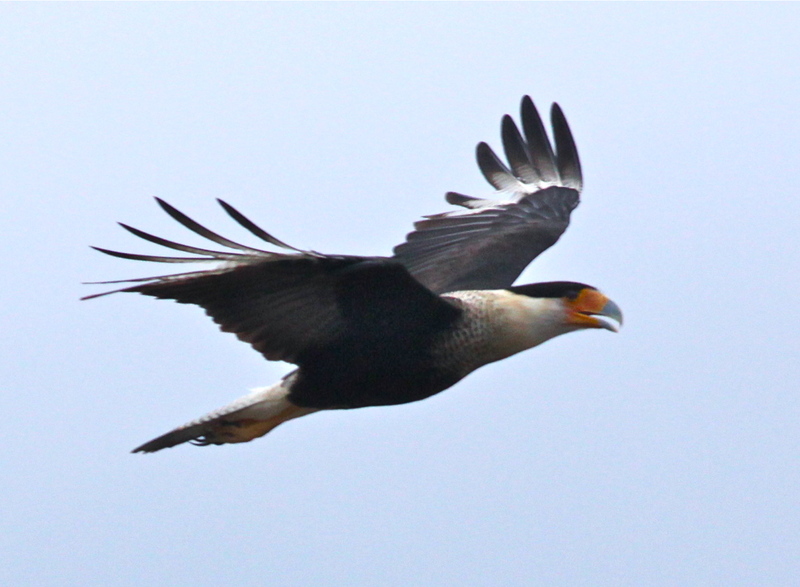 … followed quickly by another Crested Caracara. 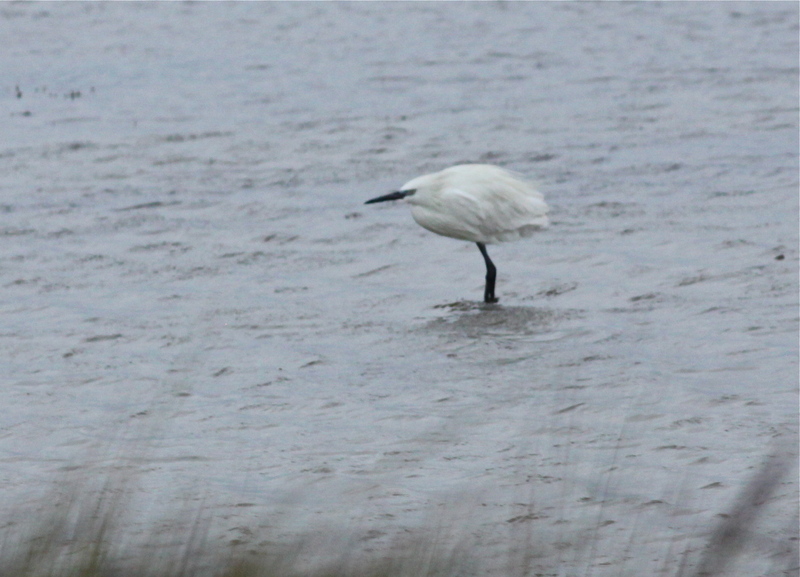 … and then disappeared from view. 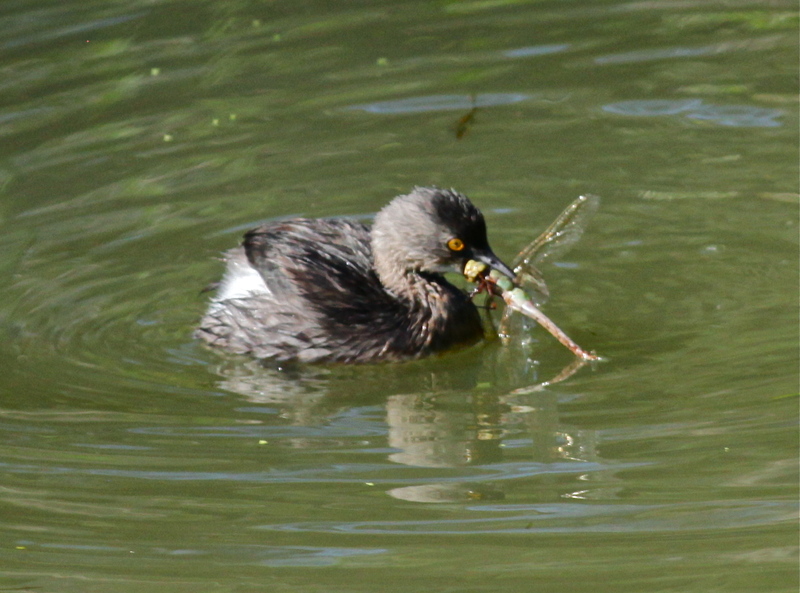 I can’t wait to see more birds today!